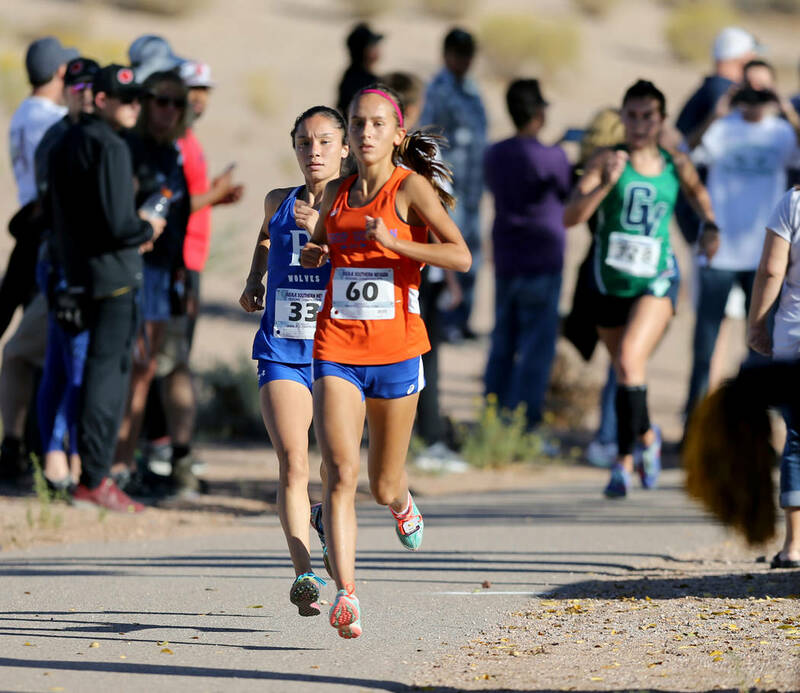 For most of her prep career, Raquel Chavez has liked to go to the front of a cross country race early and lead all the way if she can. But now as a senior, the Basic standout has adjusted her tactics to set a more manageable pace early and saving her aggressive running for later in the race. 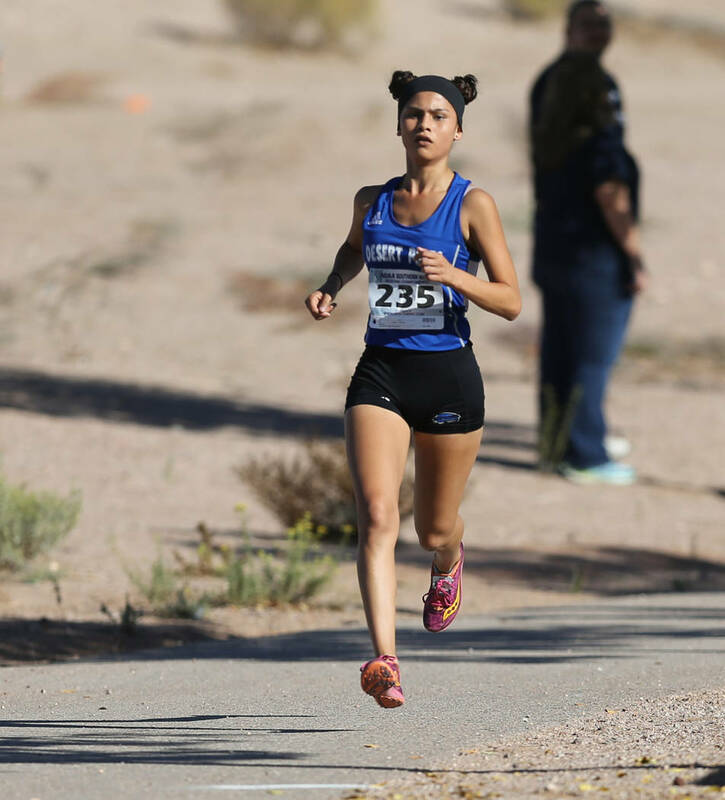 Chavez used her change of pace to her advantage in winning the Class 4A Desert Region girls race at Veterans Memorial Park in Boulder City on Friday. After pacing off of others early on, Chavez surged to the front midway through the race and avoided another last-mile fade in crossing the finish line first in 19 minutes, 25.1 seconds over the 5,000-meter course. 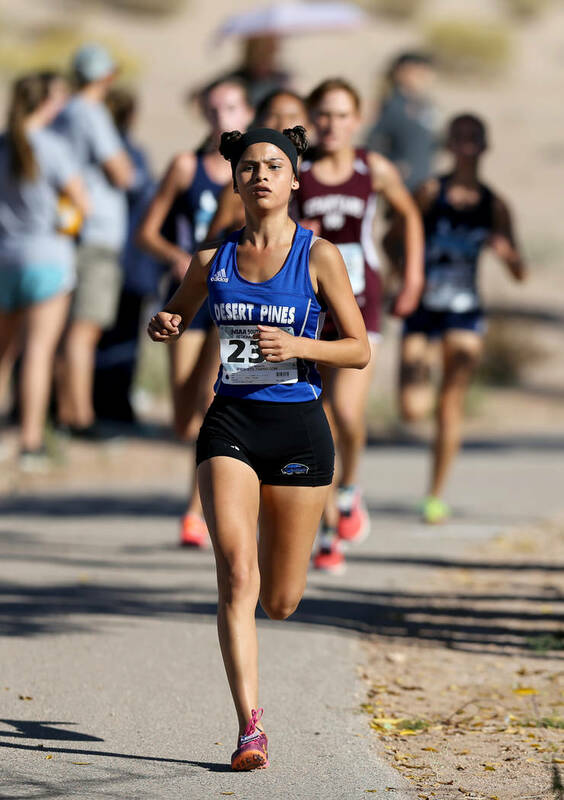 In other regional championship races, Desert Pines junior Jazmin Felix won the 4A Mountain Region girls title, Moapa Valley freshman Emma Humes took the 3A Southern Region crown, and White Pine sophomore Odessa Stewart was first in the 2A Southern Region meet. Additionally, Coronado, Centennial, Boulder City, and White Pine all won region team titles. 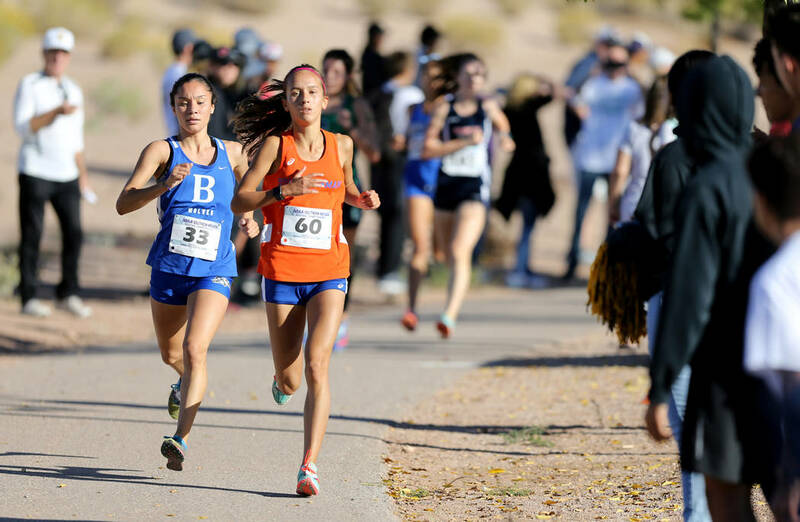 The first race on Friday was expected to be the most contested with major meet winners such as Chavez, Bishop Gorman’s Emilia Puskas, Coronado’s Claire Rawlins, Green Valley’s Mia Smith, and Sierra Vista’s Sarriah Brown all contenders. Chavez, a Sunrise Region champion as a sophomore in 2016, was content to let Puskas set the early fast pace. The two moved to the lead with Smith, Rawlins, and Brown all a few meters back. Chavez moved forward until the runners went up the long, sandy uphill portion on the back side of the course a second time. Her tactical move paid off in the third mile where she previously struggled. This time, Chavez built a lead and won the race going away. Rawlins came up for second in 19:41.8. Brown (19:45.4) nipped Puskas (19:45.6) right before the line for third. Smith took fifth in 20:09.6. Rawlins was the first of five Cougar runners in the top 18. That was enough for Coronado to hold off Bishop Gorman 61-65 for the region title. Desert Oasis won a closely contested race for the third qualifying team spot, scoring 145 points to go over Clark (151), Foothill (152), Basic (167), and Tech (170). 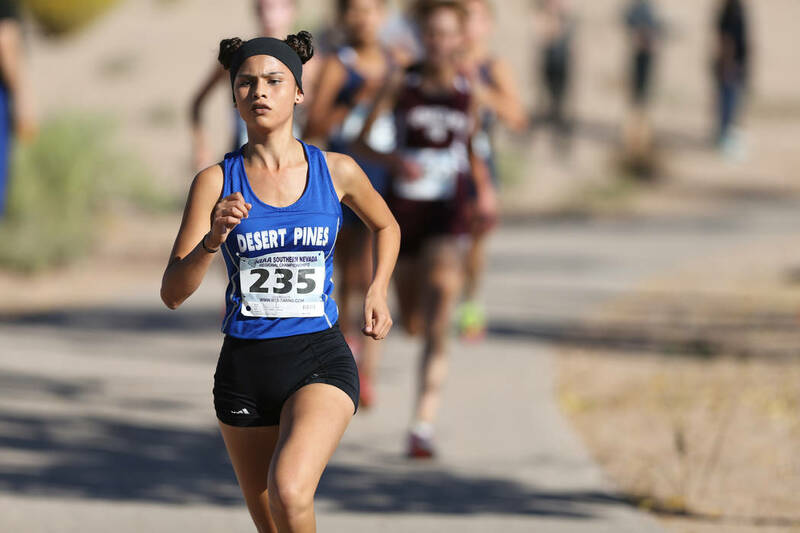 Felix broke to the front early and then started to build a lead going up the sand a mile in with only Cimarron-Memorial freshman Olivia Garcia sticking to her at that point. However, Felix soon struck off on her own midway through the race before going on to win in 19:30.6. Josephine Ruggieri closed well to finish second in 19:55 — the first of four Centennial runners in the top seven. Teammate Kloe Littleman was third (20:23.8) followed by Garcia in fourth (20:24.3). Centennial’s top-end success allowed the Bulldogs to claim the region title with 36 points, with Faith Lutheran (65) and Palo Verde (84) grabbing the other two team state berths. Humes, a freshman pulled away from teammate Shelby Olson in the final mile to cross the finish line first in 20:55. Olson, a senior, was second in 21:25.1. The two Pirates broke out in front early and were side-by-side for most of the first two miles. Olson stayed with Humes’ first kick midway through the race, but the freshman moved ahead for good going up the second uphill stretch. Valley claimed the next two spots as Frida Reyes (21:51.9) and Isabella Davis (22:12.7) went 3-4. But, Boulder City’s top five runners finished seventh through 15th. That created a tie between Boulder City and Moapa Valley at 52 points, but Boulder claimed the team crown due to having a better sixth-place finisher. Valley claimed the third team qualifying spot with 67 points over Pahrump Valley (74). Stewart came from off the pace and delivered strong final mile to win the region title in 23:20.7. She stayed somewhat back early on, but started moving up midway through the race and took the lead with roughly half a mile to go. 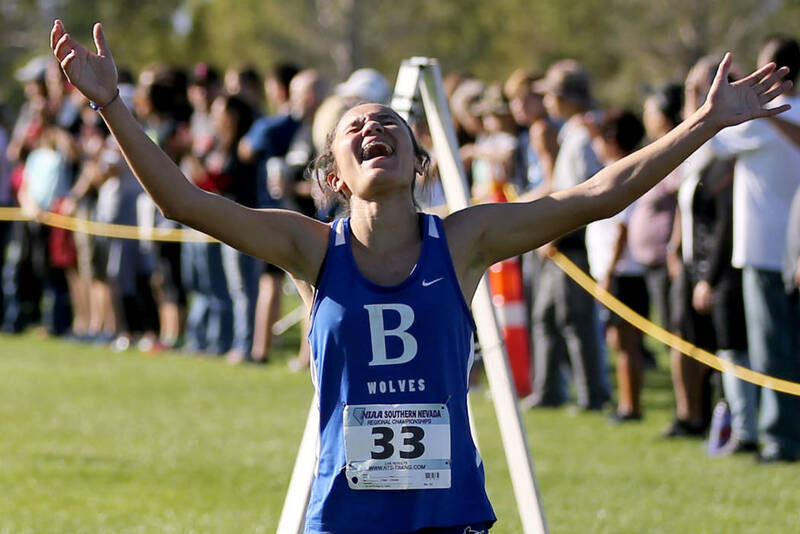 Laughlin’s Maritza Cruz was second (24:13.4), and White Pine teammate Bethany Lister was third (25:11.7). White Pine scored 21 points to win the region team title with Adelson (52) and Needles (56) moving on to next week’s state meet.